November 11, 2018…On another beautiful day in South Florida, the Men’s Senior Baseball League continued the Fall Classic Sunday afternoon. The matchup of the day featured the Atlanta Reds and the Tampa Thunder. The Thunder started the game at the plate as the away team due to seeding. Reds pitcher James Sexton took the mound to face Jason Serrano leading off the game, who was able to reach on base thanks to an error by third baseman Sabastian Diaz. Next up was Derek Martin who hit a single to right field in which Diaz utilized his speed to score in the game’s first run and the only one for the Thunder at the moment. The Reds responded with three runs themselves to take the lead in the first inning. Julius Thames, Richard Pirkle and Josh Black all produced a hit and a run that inning. In the second inning Sexton once again allowed a lead-off base runner, as Connor Rafferty hit a slingshot into left field for a single, with Chris Gormley eventually hitting a single to right for the RBI. Thunder pitcher Dayan Rodriquez showed up in the second inning as well throwing two strikeouts in a quick 1-2-3 inning. Continuing their hot bats, the Thunder scored another two runs in the third. 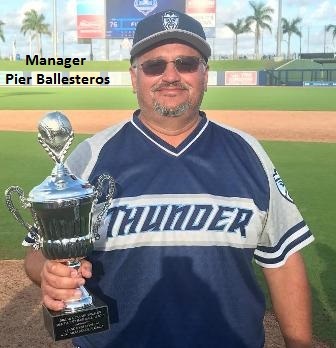 Serrano was hit by a pitch; Vic Pagan had a single with Willi Martin ripping a bases-clearing double down the left field as the Thunder took the lead once again. But the Reds weren’t going to let the game slip away from them as they too had a huge thrid inning. Once again starting from the top of the lineup they tallied two straight hits and a sac-fly by Pirkle. Following the sac-fly, Josh Black hit a single knocking in Joe Wilson. Stratel Smith kept the inning alive for the Reds as he beat out the throw to first for an infield single with Rocco Callaway scoring him in the next at bat. Though having a much shorter traveling distance than the Reds, the Thunder mentioned before the game they were a bit fatigued. It certainly showed as pitcher James Sexton cruised for the next couple of innings. Sexton, after the third inning, allowed only three hits and never saw more than four batters per inning. The Reds continued to increase their lead easing pressure off of Sexton which is what might’ve caused such a stout performance. The Fall Classic 18+ Championship ended on a strikeout to Drew Avery by Sexton. His final numbers were nine innings, four runs, six hits, and six strikeouts. The Reds first seven batters recorded at least two hits apiece with the eight and nine spots chipping in a hit each. Josh Black recorded three hits on five at-bats with three RBI. 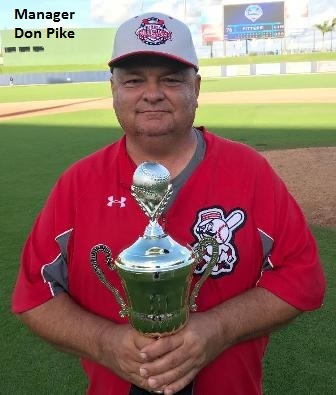 Reds manager Don Pike said after the game that he was proud of his team and couldn’t thank everyone enough for sacrificing their time for the Fall Classic Championship. 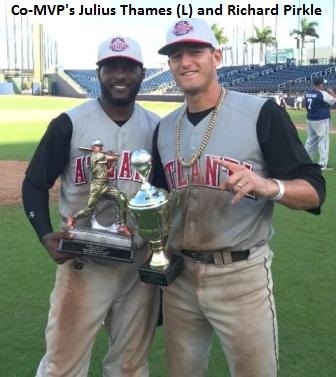 Not being able to decide on one MVP, Pike chose Richard Pirkle (2-5, 1R, 1 RBI) and Julius Thames (3-5, 2R) based on their overall tournament performance.